in 1989. It was late in that year that his wife died from cancer. Another Blue Note session followed in 1990. Since then Andrew has recorded some sideman dates including a session for Reggie Workman that saw him working with former Blue Note labelmate Sam Rivers. 1995 saw the release of a box set of Andrew's Blue Note albums which has hopefully re-vitalised interest in his recordings. 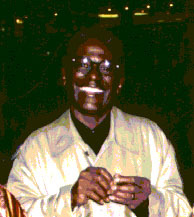 Andrews is widely considered as a most important jazz pianist and composer. Contributions, corrections and any suggestions are welcome. Vee Jay 145 - 45 r.p.m. Notes: Andrew says this was recorded in 1959, the Artist's House discography says 1955. The TCB re-issue has overdubbed strings on some tracks. Rec. Sep 9, 1963 at Van Gelder Studios, Englewood Cliffs, N.J.
Rec. Rec. Oct 2, 1963 at Van Gelder Studios, Englewood Cliffs, N.J.
the two 1965 sessions from One For One and one session released later under Sam Rivers name on Involution plus 15 alternate takes and an unheard composition. Rec. March 7, 1966 at Van Gelder Studios, Englewood Cliffs, N.J.
Rec. April 19, 1968 at Van Gelder Studios, Englewood Cliffs, N.J.
Rec. August 5, 1968 at Van Gelder Studios, Englewood Cliffs, N.J.
Rec. October 11, 1968 at Van Gelder Studios, Englewood Cliffs, N.J.
Rec. May 16, 1969 at Van Gelder Studios, Englewood Cliffs, N.J.
Rec. March 6, 1970 at Van Gelder Studios, Englewood Cliffs, N.J.
Rec. March 13, 1970 at Van Gelder Studios, Englewood Cliffs, N.J.
Rec. Dec 20, 1974 & Jan 20, 1975 at C.I. Recording Studios, N.Y.C. Rec. May 19 & 20, July 31, 1975 at Vanguard Studio, N.Y.C. Rec. July 10, 1975 at C. I. Recording Studios, N.Y.C. Notes: the Hill Quartet appear on one track only. This compilation which was issued with the Italian jazz magazine "Musica Jazz", issue no. 6/96 for June. Chico Hamilton, Don Byron, Yusef Lateef and Butch Morris. Rec. December 5 & 6, 1993 at Kampo Audio, N.Y.C. Michael Cuscuna's booklet accompanying Mosaic's The Complete Andrew Hill Sessions CD box set as well as liner notes from various albums. 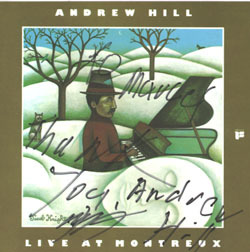 Andrew Hill toured Australia during October 1996 and I have discussed my site with him. Andrew said he would endeavor to collaborate with me on this site - I'm still waiting Andrew! so all releases should be available. There have been visits to this site.